What is Bravecto Topical for Dogs? Bravecto Topical for Dogs is a topical flea and tick preventative that provides continuous protection for up to 12 weeks. It also protects against lone star ticks for up to 8 weeks. Bravecto Topical for Dogs is easy to apply and remains effective against fleas and Ixodes ricinus ticks following bathing or swimming. For Bravecto Topical for Dogs to remain effective, don't bathe or let dog swim until 3 days after application. Bravecto Topical for Dogs requires a prescription from your veterinarian. NOTE: To protect cats against fleas and ticks for up to 12 weeks, use Bravecto for Cats. Bravecto is also available in a chew option. See Bravecto Chews. For heartworm protection, try Ivermectin Pyrantel - Generic to Heartgard Plus. Remains effective against fleas and Ixodes ricinus ticks following bathing or swimming (if dog hasn't bathed or swam less than 72 hours after application). How does Bravecto Topical for Dogs work? 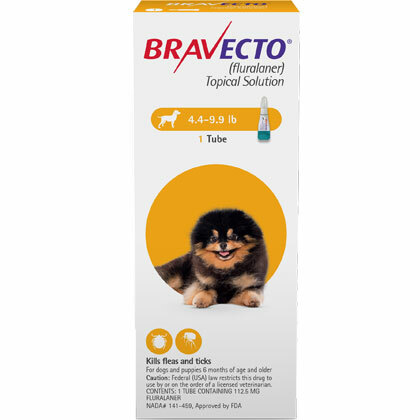 Bravecto Topical for Dogs is indicated for the treatment and prevention of flea infestations. It kills adult fleas and also treats and controls tick infestations, including Ixodes scapularis (black-legged tick), Dermacentor variabilis (American dog tick), and Rhipicephalus sanguineus (brown dog tick). For topical use on dogs and puppies over 6 months of age and weighing more than 4.4 lbs only. Not for use on humans. Use on dogs only. Keep out of the reach of children and pets. Do not touch or allow children to touch the application site until it is dry. Do not eat, drink or smoke while handling Bravecto Topical for Dogs. Avoid contact with skin and eyes. If contact with eyes occurs, then flush eyes slowly and gently with plenty of water. Wash hands and contacted skin thoroughly with soap and water immediately after applying Bravecto Topical for Dogs. What is the most important thing I should know about Bravecto Topical for Dogs? Bravecto Topical for Dogs is a flea and tick preventative for dogs and puppies over 6 months of age and weighing more than 4.4 lbs only. 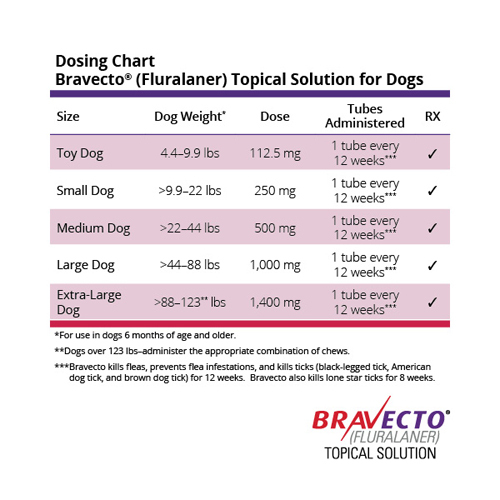 The active ingredient in Bravecto Topical for Dogs is fluralaner. Each tube is formulated to provide a minimum dose of 11.4 mg/lb of body weight. Bravecto Topical for Dogs requires a prescription from your veterinarian. What should I discuss with my veterinarian before giving Bravecto Topical for Dogs to my pet? Tell your veterinarian if your pet has a history of seizures. How should Bravecto Topical for Dogs be applied? Use the appropriately sized tube of Bravecto Topical for Dogs according to your pet's weight. Remove the tube from the pouch and twist open the cap. While your dog is standing, part the hair on your dog's back between the shoulder blades and gently squeeze the tube at 2-4 spots along your dog's back. Avoid applying an excessive amount of solution in any one spot, so that the solution does not drip down the side of your dog. To ensure Bravecto Topical for Dogs remains effective, do not bathe or allow your dog to swim for 3 days following application. After 3 days, Bravecto Topical for Dogs will remain effective against fleas and Ixodes ricinus ticks even after bathing or swimming. Treatment with Bravecto may begin at any time of the year and can continue year round without interruption. What are the potential side effects of Bravecto Topical for Dogs? Use with caution in dogs who have a history of seizures. Seizures have been reported in dogs following the application of fluralaner. Some dogs without a history of seizures have also experienced seizures following application of fluralaner. What happens if I miss giving a dose of Bravecto Topical for Dogs? What happens if I overdose my pet on Bravecto Topical for Dogs? If you suspect that your pet has received an overdose of Bravecto Topical for Dogs, consult your veterinarian or emergency veterinary clinic immediately. What should I avoid while giving Bravecto Topical for Dogs to my pet? Avoid oral ingestion. Do not use on dogs with a history of seizures. Bravecto Topical for Dogs is highly flammable. Keep away from heat, sparks, open flame or other sources of ignition. What other drugs will affect Bravecto Topical for Dogs? Step 1: Immediately before use, open the pouch and remove the tube. Hold the tube at the crimped end with the cap in an upright position (tip up). The cap should be rotated clockwise or counter clockwise one full turn. The cap is designed to stay on the tube for dosing and should not be removed. The tube is open and ready for application when a breaking of the seal is felt. Step 2: Your dog should be standing or lying with its back horizontal during application. Part the fur at the administration site. Place the tube tip vertically against the skin between the shoulder blades of your dog. Step 3: Squeeze the tube and gently apply Bravecto in one or more spots starting between the shoulder blades and continuing along your dog's back. Avoid applying an excessive amount of solution in any one spot which may cause some solution to run or drip off of your dog. Bravecto should be administered topically as a single dose every 12 weeks according to the Dosage chart below to provide a minimum dose of 11.4 mg/lb (25 mg/kg) per body weight. Bathing or water immersion 3 days after administration will not reduce the effectiveness of Bravecto against fleas and Ixodes ricinus ticks (see Effectiveness). Bravecto may be administered every 8 weeks in case of potential exposure to Amblyomma americanum ticks. *Dogs over 123.0 lb should be administered the appropriate combination of tubes. Do not store above 77°F (25°C). Store in the original package in order to protect from moisture. The pouch should only be opened immediately prior to use. Inactive Ingredients: Dimethylacetamide, glycofurol, diethyltoluamide, acetone.